The housing market that is. Over the next couple of weeks my husband and I will be working on making our house shine. I always hate that these last little projects that have been on your "to do" list don't get done until you are ready to move out! You put in some hard work, spit and shine, and elbow grease into a couple of weeks and then you don't get to enjoy them! Oh well, cest la vie! We are still hanging on to some marginal thread of hope that something miraculous will happen and we won't have to leave our lovely home after all. Yeah, I know wishful thinking but it doesn't hurt to dream! So we have made a list of things that need to be done to our house. Hubby has a list and I have my own list, each list is about 10 items long. My list consist mainly of curb appeal items, but it also involves painting my laminate counter tops (I'm excited to try this), painting the bathroom cabinets, and general cleaning of the house. 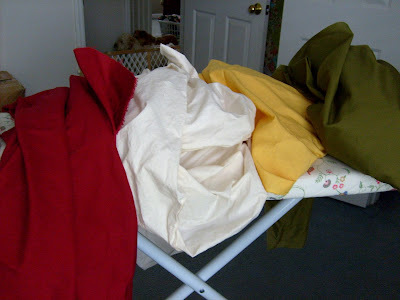 One of the things on my list is to make pillow covers for the giant 25"x25" pillows we have on our futon. They are all mismatched and the light colored ones are now looking dingy thanks to the kids. I purchased them oh, about 1 year ago with the intent of eventually recovering them. Well it's moving time and decided new pillow covers would tie my living room together. I bought the pillows at Old Time Pottery for $5 each - what a great deal! 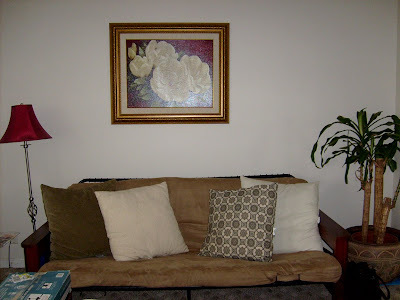 The theme of the room is set by my adjacent kitchen and this painting that hangs over the couch. 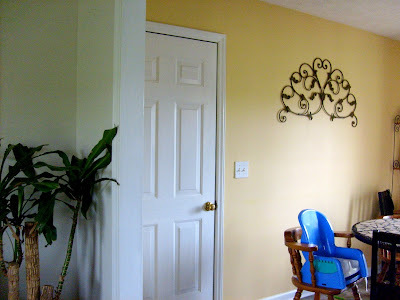 The yellow of the kitchen matches the yellow flower centers. But at $40+ each (just for the pillow cover not the pillow inserts) That would have been $160! I can think of much better ways to spend $160 than on pillow covers. I went to the fabric store two days ago and spent $25 on fabric for all 4 including some wooden toggle buttons (I was going by a year old memory of the pillows) I might go back and exchange the buttons, we'll see. 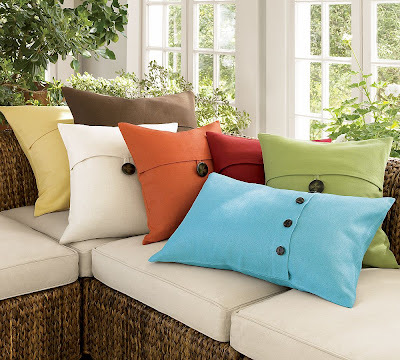 I love the look of having different colored pillows. It's still coherent because the are the same style. 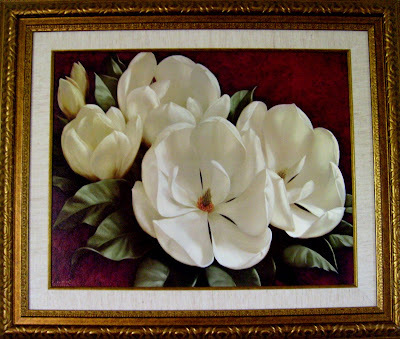 I'll be pulling my pillow colors off my magnolia painting shown above: dark red, sage green, yellow, and ivory. I'll take pictures as I make these super easy envelope style pillows so I can write a tutorial. I can't make promises as to when they'll be up though! I can't wait to see. I bet it will be smashing. Maybe it will finally be the inspiration I need to get my couch pillows done.